These past couple of evenings have been bitterly cold – which stalled my walk to Jerusalem. But I got back on the trail this morning doubled up. It is still a little on the cool side – but very beautiful out there. Many of us have to read for our jobs, and we pride ourselves on how rapidly we can move through vast quantities of print. But the Bible discourages us from making mileage a measure of success. In many cases, its riches are perceptible only to those who move slowly, like mushroom hunters, peering closely where at first there appears to be nothing at all to see. Almost always it is useful to linger over a word or a phrase that seems strangely chosen…For it is by means of words that the Bible performs its revelatory function. An unexpected word can jar us into contemplating new possibilities about how things really are. An ambiguous word jogs our minds onto a completely different track. Often when reading one portion of scripture, we run across words that echo another passage. Thus the biblical writers lead us subtly to make connections—between events in the text and likewise between events in our lives—that we had never previously imagined. It occurred to me that my walks have been great times of contemplation – but less so when I am worried about how far I have gone and how long it took me. I have been able on some evenings to linger over the sights, sounds and smells around me. Davis is quite right that we often do the same with scripture, or for that matter other books as well. But the Bible is really rich in using stories, moments, and images that, when properly absorbed, can reveal to us things that are new in each reading. I encourage us all to revisit how we read our sacred text, take our sacred walks, listen to our sacred music… take a moment. It is Revelatory! Want know more about this book and discuss it with others? 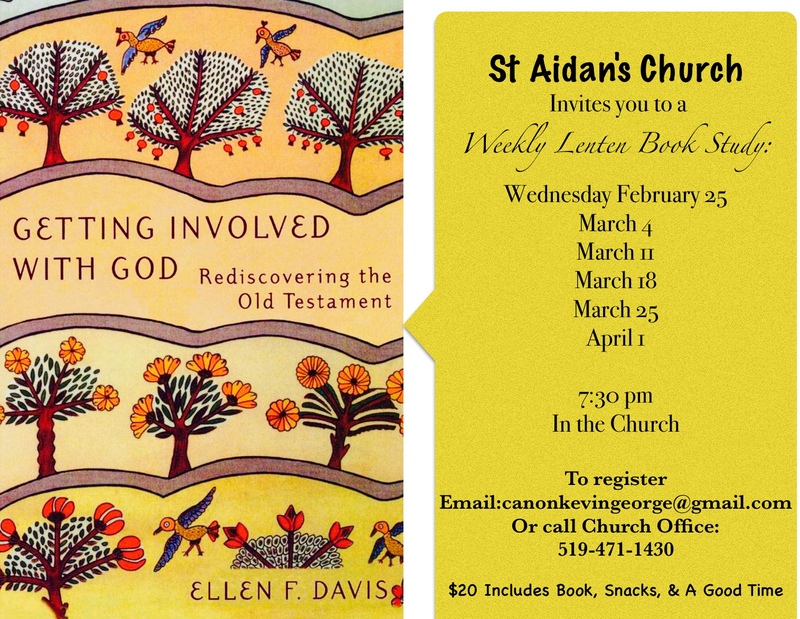 You can join us we linger over its words together as a book group on Wednesday’s throughout Lent! As I walked I, today, I also offered prayers of thanksgiving for the people of the Parish of St Aidan’s and for the opportunity I have to serve with them. Yesterday we had a very positive and life-giving Vestry Meeting! Thank you to all who participated, and all who took on ministries for the year ahead. We look forward now to March 1 which will be our VOLUNTEER MINISTRY SUNDAY. We are entering into a couple of weeks of prayerfully discerning how we serve God in this parish. We have much to look forward to as we build on great 2014.